Eaton, founded in 1911, is a leading global power management company with approximately 95,000 employees around the world. With an innovative vision of improving quality of life and the environment through the use of power management technology and services, Eaton products are used by customers in more than 175 countries. As with many large, global corporations, Eaton was challenged with driving a culture of recognition that made every employee — including offline workers — feel valued and appreciated. 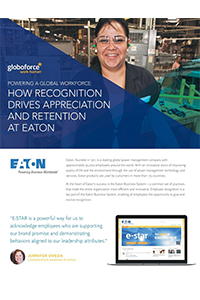 Eaton partnered with Globoforce to launch E-STAR, its global social recognition solution. With 10 differentiated award levels, 23 languages available, and an easy mobile application, E-STAR offers a truly customized recognition experience. Eaton saw rapid adoption of E-STAR, with 68% of employees participating in the first six months, 82% participation in year one, and sustainable 82% rates year after year thereafter. In this webinar on Eaton’s recognition journey, we discuss how they’ve kept the program fresh and how you can find success at your company.